Ohio Birds and Biodiversity: New moth species discovered! John Howard, of Adams County, Ohio, sent along an interesting email today. While exploring one of the nicer prairie barrens in Adams County a few weeks back, John found a caterpillar that he couldn't place, or pin a name to even after consulting the literature. He did make some excellent photos, and just received word back from lepidopterist Loran Gibson as to its identity. Read on. John's mystery caterpillar was consuming this plant, the scurf pea, Orbexilum onobrychis. This is a native plant that can be rather common in prairies, sometimes forming sizeable colonies. And here it is, a rather charming little animal and seemingly distinctive with those rows of black polka dots. I can see why it caught John's eye and why he would want to know what it is. The larva that you have a photo of is certainly an interesting species. It belongs to a moth in family Noctuidae and genus Schinia. The larvae are known from one location in Illinois, one location in Indiana, one location in Kentucky, and now, one location in Ohio! 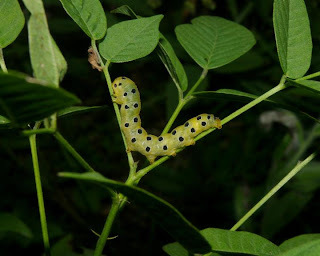 It is always found on Orbexilum onobrychis (scurf pea). The species is new to science. Although the larvae have been found a few times, the adult moth remains unknown and undescribed. Terry Harrison of University of Illinois tried to rear one of the Illinois larvae a couple of years ago, but was unsuccessful. The moth developed inside of the pupal case, but it did not emerge. Terry dissected the pupal case and saw the unopened wings. 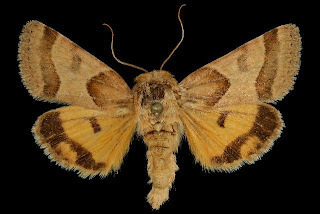 From that he was able to say that the moth is related to a western species known as Schinia jaguarina, but that is all that we know about this species. It is quite rare and you are fortunate to have the species at Kamama! Congratulations! Thank you for sending the photo! It adds significantly to our knowledge! Presumably, the adult of this new species, as yet only know from caterpillars, will somewhat resemble the species in the photograph above. This discovery just goes to show that there are still finds to be made, and as yet unknown animals lurking out there. It is vital that we protect big blocks of habitat to prevent the destruction of organisms that we don't yet know about, as well as those that we do. Congratulations to John Howard for yet another extremely noteworthy find! Too cool! Maybe John can go back and find the caterpillar again and try to raise it to adulthood. Great find, I wonder what else is out there. This reminds me how important it is to check out every little thing along the trail. You just never know when you'll find something really cool--maybe something even the rest of the world has yet to see! That is absolutely spectacular! Way to go John! (And thanks for sharing, Jim.) I echo Nina's sentiments. Wow! Way to go John. I certainly hope that someone can raise an adult and get some good photos. Very cool find indeed. Thanks for sharing this Jim and John wonderful discovery, congratulations! Thanks for your comments, everyone. Yes, a great find by John - one of many that he has made.